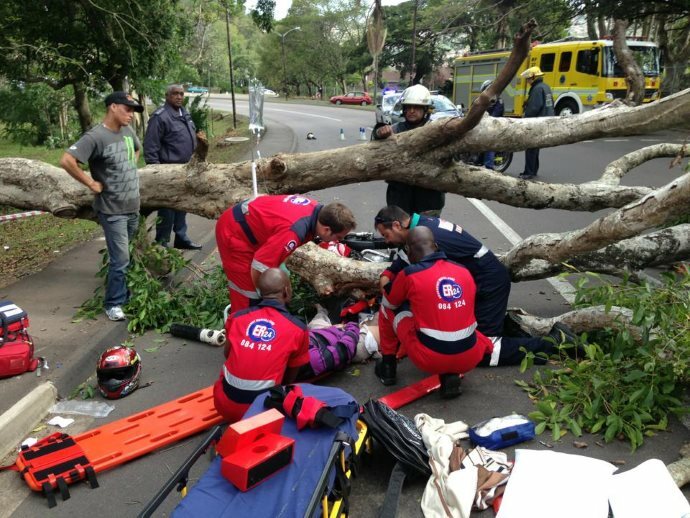 A rather small part of road crashes can be blamed on environmental factors. Driver error and the inability to adjust driving to different road and weather conditions are however significant contributors to road crashes. 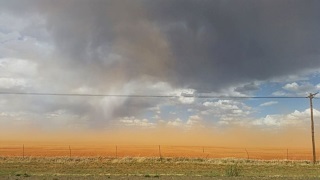 On the Arrive Alive website, we share information on aspects such as driving in bad weather and also discuss specific weather conditions such as fog and mist, snow and heavy rains. In this section, we would like to offer advice on how to adjust driving in high wind conditions. 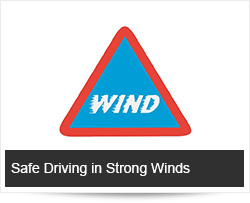 What are the Risks of Driving in Strong Winds? When driving in exposed areas sudden gusts of wind could catch you off your guard when bouncing against your vehicle. 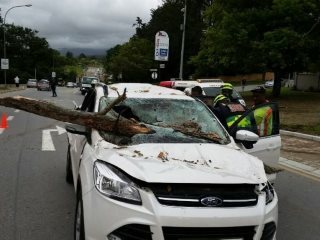 High winds get under a car, affecting the handling and braking significantly. When overtaking large heavy vehicles, strong winds could result in a sudden gust from the side as you pass by. Large vehicles are blown around easily as they become a sail in the wind, drivers struggling to keep them inside their lanes. Vulnerable road users such as pedestrians, cyclists and motorcyclists and people on horseback are easy targets to be moved into the path of other road users by strong winds. High winds and sudden gusts are unpredictable but there are specific areas and circumstances where extra caution would be required. Road signage in areas prone to strong winds and weather reports should be clear warning to be vigilant and alert to strong winds. Exercise caution on open stretches of road such as highway overpasses. Tunnels and ‘road cuts’ through mountainous areas can create funnels for wind. Caution also required when crossing high exposed bridges or gaps in hedges. Debris may easily be blown onto the roadway. Remain alert to possible falling tree branches. 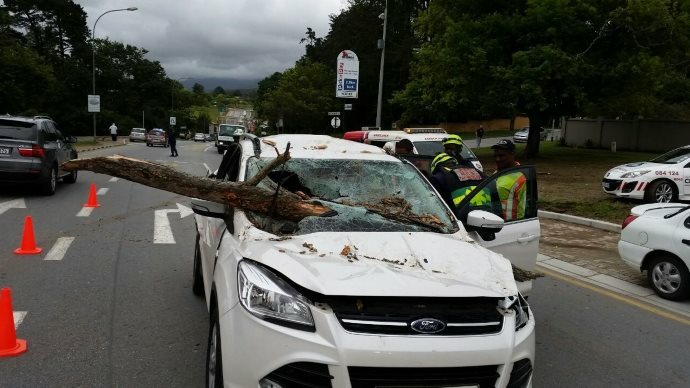 Seeing twigs or small branches in the road should warn you that there could easily be a tree or large branch in the road around the next bend.  Overtaking and passing high-sided vehicles such as trucks, vans, SUVs. Vehicles towing a caravan or trailer have increased susceptibility to cross-winds. Also remain alert to the smaller vehicles with top or roof boxes/roof racks. In rural areas guard against animals that might come across from fences downed by trees or farm gates blown open. Areas, where roads cross underneath power lines, are areas for special caution. A driver should never drive over downed power lines. High-voltage wires may still be alive and very dangerous. Strong winds also bring along other perils such as dust and heavy rains with reduced visibility. Ensure that your vehicle is roadworthy - Don’t put yourself and others in danger driving in these conditions with a loose windscreen wiper slapping in the wind! Do not drive with an overloaded vehicle and with large objects protruding from your vehicle in strong winds. The best decision may often be to “wait it out” and stay off the road until the weather clears or wind subsides. Keep an eye and ear on news and weather reports on the radio or on social media. News bulletins and alerts on mediums such as Twitter could offer info on specific hazards, reduced speed limits and road closures. Narrow roads are more likely to get blocked by fallen trees, branches and wet leaves in the windy weather - it is best to avoid narrow roads and lanes more exposed to debris. Consider whether there is not a safer route that is more sheltered from the wind. Always pack for readiness in an emergency. Carry a fully-charged mobile phone and warm, weatherproof clothing. Always plan ahead leaving extra time to reach your destination and allowing you peace of mind that slower driving will get you there in time. When you need to stop doing so away from trees, power lines or other tall objects that could fall onto your vehicle. When you have stopped safely phone family or friends to inform them that you have stopped for a while and are safe. You need to drive with a defensive attitude, starting with wearing your seatbelt and ensuring passengers are buckled up as well. Keep all your attention on the road and other road users. Avoid all driver distractions and leave the phone alone. Reduce any possible distractions by turning the radio down. Attentiveness to trees, hedges and overhead cables may offer guidance to the wind's direction and strength. By looking further up the road you may also be able to anticipate dangerous areas and the impact that the strong winds have on other road users. Keep an eye on what is happening to other vehicles and whether they are safely kept inside their lanes. Anticipate! You may be buffeted by the wind or the slipstreams of other vehicles as well as gusts when overtaking high-sided vehicles. Keep both hands firmly on the steering wheel and both eyes on the road. A firm grip with both hands is required when the wind begins to move your vehicle, especially if you are driving a large vehicle or towing a trailer. At a reduced speed, you have more time to react and avoid hazards such as debris or other road users straying out of their lames. In mountainous areas and bends expect there to be debris from the strong winds around every corner. Be prepared and able if you are required to make a sudden stop. At a slower speed, you will also have better control of the vehicle. The faster you drive the further off-course you're likely to drift in a sudden gust before you regain control of the vehicle. Keep extra distance between you and the car in front - consider increasing the two-three second rule to 5 or 6 seconds. This is especially important when following trucks, buses, or all vehicles towing trailers and caravans. If you see a truck driving ahead that is losing its load, give it a wide berth. 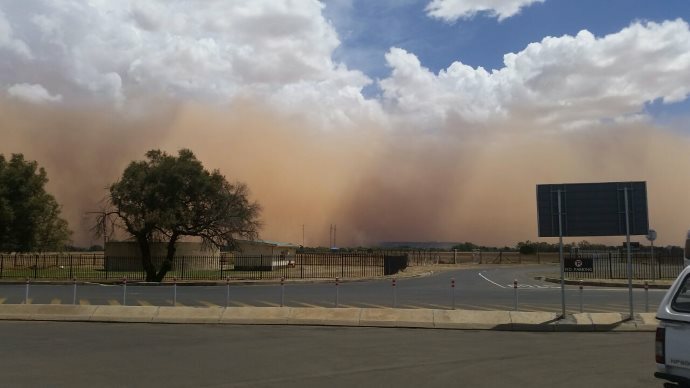 Turn on headlights as you may encounter potentially lower visibility created by blowing dust, sand, snow or rain. Be ready to make steering corrections when driving from wind-protected areas to unprotected areas. Be extra defensive near trucks and give them some extra space. Only overtake if you need to and you are convinced that you can do so safely. Do not panic or turn your wheel quickly or suddenly, make only smooth and gentle movements. When you arrive safely at your destination, do not park near trees or downed power lines. Avoid parking near anything that could be blown over onto you or your vehicle. Apply your handbrake when parking, leave a manual gearbox in gear and if possible park the vehicle where it is facing the wind head-on.